This image was disqualified from the Best of 2008 challenge. This was taken in Savannah, GA. Came across it when my husband and I were walking around the city. I really like what you did to this and all your other photos in your bio. I'm adding you to my favorites list! Beautiful stately image. VERY nice! Sorry about your DQ, it happens sometimes but I really enjoyed the pp on this one, lovely way to do the desat and make the greens so vibrant. Sorry about the DQ -- especially hard when its a personal best. This is such a nice photo. 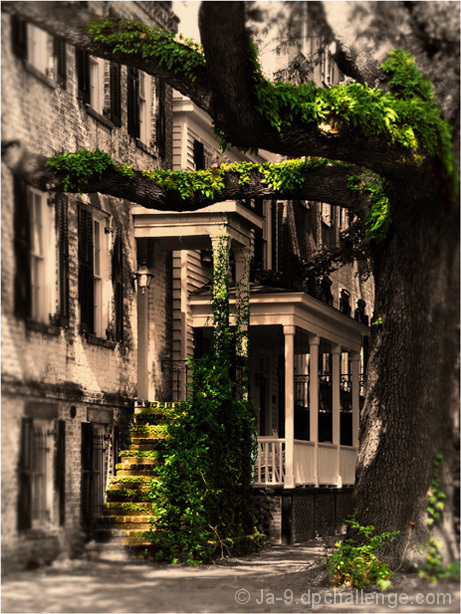 I can't decide which I like better -- the tree or the house. They both are so interesting and meld into a really nice composition, with the vines tying them together. Message edited by author 2009-01-23 08:38:37. A high placement, congrats! I'd tell you what I gave it, but this did not come up in the 30% or so that I voted on. I LOVE the selective desaturation here -the colors are so rich and beautiful. I'm a little unsure about the blurry edges though, they seem kind of abrupt, and don't integrate smoothly into the rest of the photo. But otherwise this is very nice. Louisiana? Those houses are beautiful. Stnning work with the focus and color here. Interesting angle too. Interesting selective color here. hmmm.... I think I like it. Proudly hosted by Sargasso Networks. Current Server Time: 04/22/2019 08:35:50 PM EDT.